To check for an actual shorted SCR after experiencing an "Shorted SCR, FC59" Fault Trip, disconnect all external line and load connections from the unit and place the leads of the meter on each pole, line-to-load as shown. Resistance of each power pole should be greater than 10k ohms. 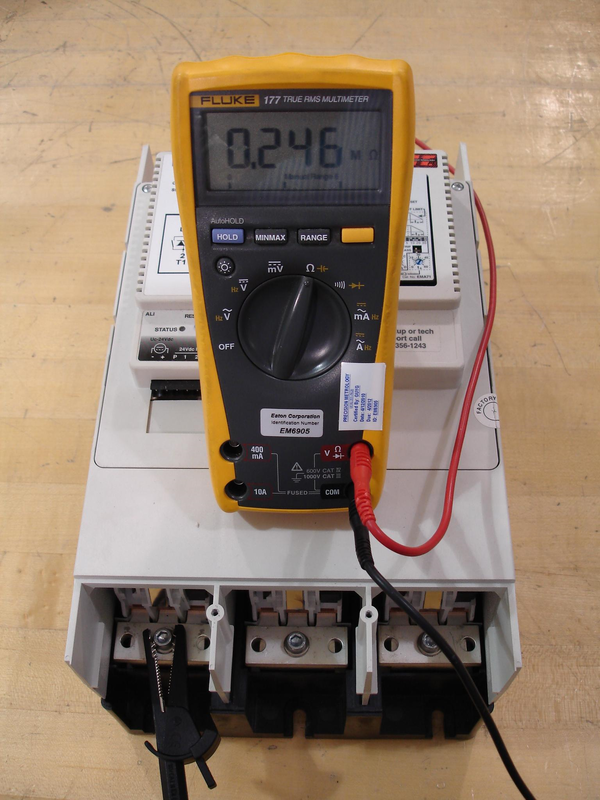 The following measurement used the meter on the 1mΩ manual scale. Some meters take a long time to "settle" or "stabilize" to get an accurate reading. Using another meter to get comparative data will normally get you another set of similar, but not identical values. Using test points (probes) instead of crocodile clips will give you to the ability to get different values based on your technique with the probes. A value greater than 10kΩ but less than ∞ or O.L indicates a serviceable unit. A value of ∞ or O.L indicates an open SCR. A value of 2 - 7 Ω indicates a shorted SCR. As long as the measurements are greater than 10kΩ the unit can be returned to service. Additionally, there is no correlation between the (low or high) pole values and remaining service life.